Build your own cozy home on wheels! Everything you need to know to plan the best van for you! A step-by-step guide detailing the whole build process from demolition to move in! Specific products we use and recommend! Sample floor plans for 144" and 170"! Our build with floor plan and elevations including dimensions and measurements! ✔ A PDF download that can be instantly downloaded to your iPad, iPhone, Android or computer immediately after purchasing! Reusable anytime you need it! The Van Guide is so well thought out and takes you through all the questions you have and all the questions you should have thought of. They take the guess work out of everything from start to finish whether you are doing a Sprinter van or whatever type of vehicle you choose. They have great photos if you are a visual learner like myself plus we even texted back and forth regarding questions I had about solar so that I understood it better. You can't beat the price for all the knowledge and expertise you are going to get out of this. The flow of this guide is easy to read, follow and in the right order. They give you all types of options for you to choose depending on your finances, style and needs. This is a must for all DIYers. We purchased CreateWondr’s E-Book after following their build and journey on Instagram and YouTube. We knew they were knowledgeable and we love their build but we didn’t know how much of a treasure trove of information they would pour into their e-book. It is truly an amazing resource; we even reference it standing in the aisles of Home Depot while deciding what and how much to buy for our build! I chose to buy a pre-built van because the idea of planning the perfect layout, picking the right materials, cutting holes in a vehicle that costs thousands or tens of thousands of dollars, and actually executing scared me way too much. 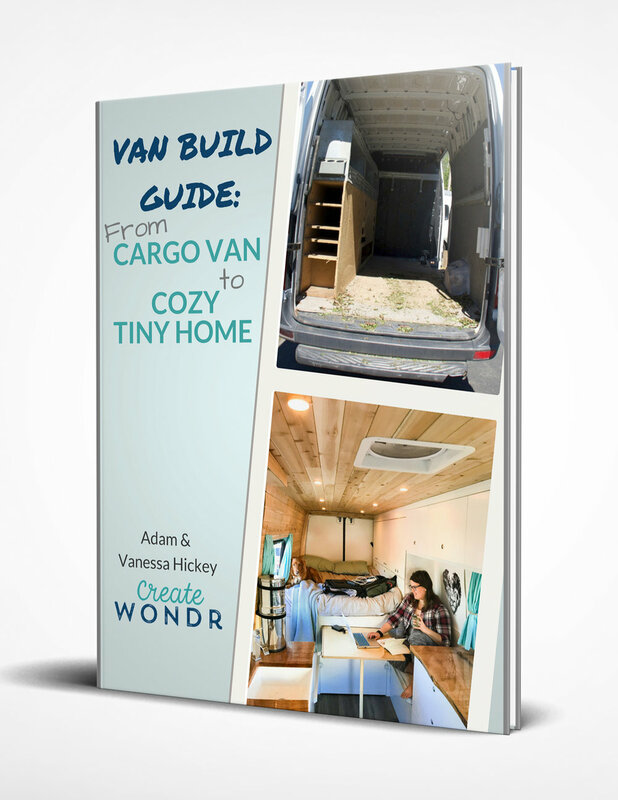 If I had this guide before buying my van, it would have given me a LOT more confidence in taking the DIY route. They explain each step of the process in plain English, down to the best screws, individual fittings and component pieces required for plumbing, electrical, and cabinets. There’s even a certain money (and time) saving tip on page 26 that will save you enough to pay for this ebook multiple times. I’ve seen their van in person, and it is drool-worthy. This is a step by step guide to build your own drool-worthy van. Worth every penny. If you have any questions about the book, or any technical questions don't hesitate to reach out to us by email at mytimeto@createwondr.com. We will respond to you promptly!